Sending your children into the world. Encouraging them to discover the world and find themselves. That’s what this short film is about. The glass-art, video-art, dance and music made with glass, together create a captivating film. In the film you see five droplets of glass, the children of Artist ,glass maker Jelena Popadic. Together with her daughter Tara Wilts she encourages the children to make their own way. Letting go hurts. 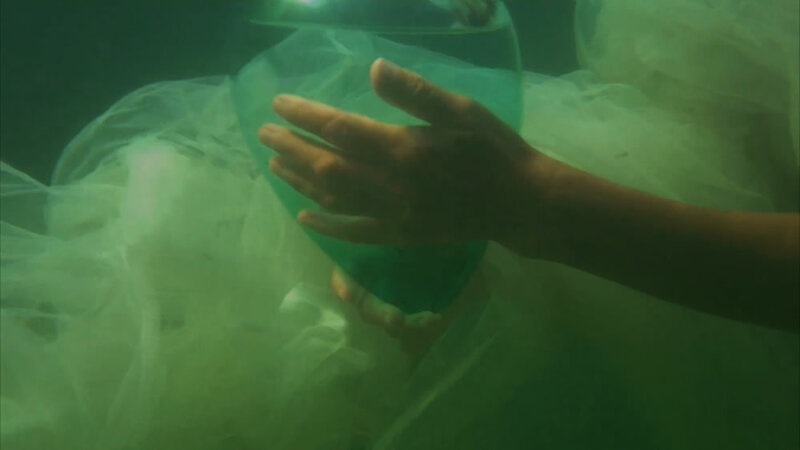 Jelena Popadic improvises a dance for them on the beach She brings, together with Tara Wilts the glass droplets to the lake and they continue to dance with them underwater. Creating a mysterious veiled image. Finally, the children float away, into the distance. The music is composed and performed for the film by Ewout van Roon. Who also wrote the lyrics to the song Hello World, which is sung by Tara Wilts. The music is, for the most part, made from the sounds of glass: singing glass, humming glass and vases and chimes. The film was recorded in august 2016 by the Mondsee in Oostenrijk. Video artist Ewout van Roon filmed, edited and funded the film himself. The film is 7 minutes and 20 seconds long.